Many predators search for their prey with their eyes. As a result, many prey species have evolved special body coloration to reduce their chance of being eaten. For example, many prey species blend in with their environment, making it difficult for the predators to find them. These species use camouflage as their first line of defense. Another word for this type of defense is "crypsis" or "cryptic coloration." Cryptic coloration is especially common in small animals such as insects, lizards, snakes, and frogs. These animals are often the same color as the leaves or twigs on which they rest. Some insects even look like the twigs or leaves themselves. It is important to remember that crypsis is not just a morphological adaptation, but that behavior plays a very important part as well. Crypsis works only if the animal is resting on the appropriate background and usually only when the animal isn't moving. 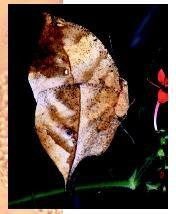 An Indian leaf butterfly exemplifying cryptic coloration. Many small animals have evolved toxic chemicals that make the creature poisonous to eat. Interestingly, many of these species are brightly colored, making it easy for the predators to see them. Scientists believe that the bright coloration has evolved to help the predator, often birds, remember that the species is poisonous. For example, if a bird eats a poisonous butterfly or frog, it will get very sick. In some cases, the poison is released so quickly that the bird will spit the prey out and avoid swallowing it. In either case, it is probably easier for the bird to remember to avoid this species in the future if the prey is distinctively colored. Experiments have shown that it often takes only a single encounter with a toxic prey species for a predator to learn to avoid it. Warning coloration, sometimes referred to as aposematic coloration, is found in a wide variety of animals, including insects, mites, spiders, and frogs. One problem with being defended by toxic chemicals is that the animal has to use energy to make the chemicals, energy that could otherwise be used for such things as growth and reproduction. Some animals have evolved a way to enjoy the benefits of warning coloration without the costs. These animals mimic the coloration of the poisonous animals. This type of mimicry is referred to as Batesian mimicry, named after the nineteenth-century British naturalist who first described it. The best-known example of Batesian mimicry in the United States and Canada is probably the Viceroy butterfly that looks remarkably like the poisonous Monarch butterfly. The two species are unrelated and the caterpillars feed on different plants and do not look anything like one another. However the adults of both species look so similar that most people, and more importantly, most birds, cannot tell them apart. It is important that the Batesian mimic be less common than the toxic model species. For example, if the Viceroy were more common than the Monarch, birds would end up eating a lot of Viceroys before eating a Monarch and would not "learn the lesson" the coloration acts to teach. Alcock, J. Animal Behavior: An Evolutionary Approach, 6th ed. Sunderland, MA: Sinauer Associates, Inc., 1998.